Existing research suggests that Veterans experiencing homelessness make disproportionate and costly use of acute health, mental health and substance abuse treatment services, but that placement in programs like the US Department of Housing and Urban Development-VA Supportive Housing Program (HUD-VASH) can result in substantial reductions in the utilization of these services and associated costs. Several studies have demonstrated that, for certain high need individuals and Veterans, cost savings resulting from the reduction in these acute care services subsequent to placement in permanent supportive housing (PSH) can substantially or completely offset the cost of providing PSH and may even result in net cost savings. 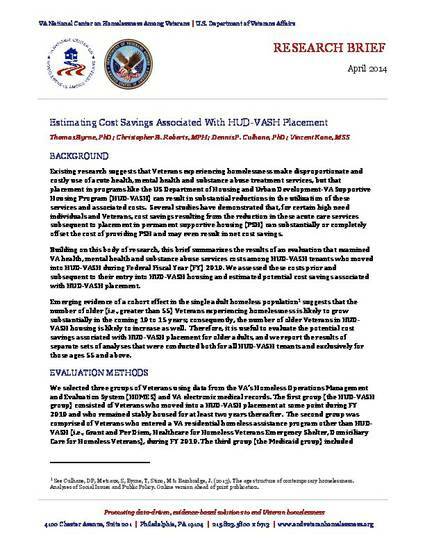 Building on this body of research, this brief summarizes the results of an evaluation that examined VA health, mental health and substance abuse services costs among HUD-VASH tenants who moved into HUD-VASH during Federal Fiscal Year (FY) 2010. We assessed these costs prior and subsequent to their entry into HUD-VASH housing and estimated potential cost savings associated with HUD-VASH placement.